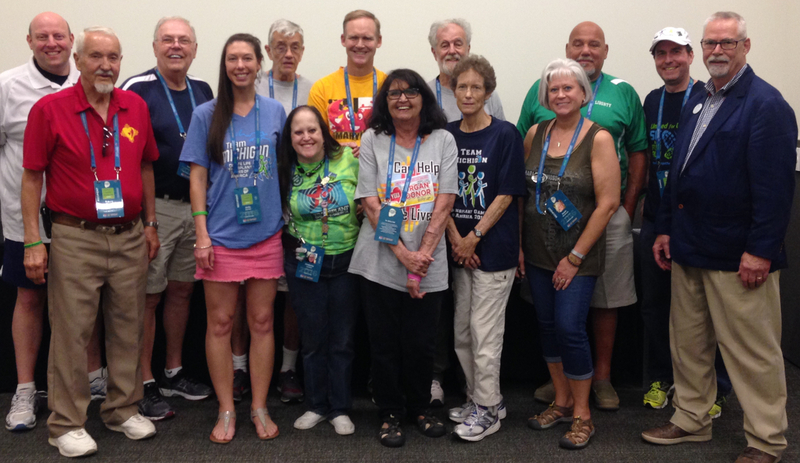 At the conclusion of the 2012 Transplant Games in Grand Rapids, a decision was made to form an Athletes Advisory Council. The role of the council will develop over time but the concept was to give a voice to athletes and participants who could make recommendations and provide advice based on best interest of the games. Currently members serve a staggered 2-year term so that way every year we have approximately half of our members as incumbents and half of our members newly elected. I am a two time liver transplant recipient. When was 15, I went on vacation with my parents. While on vacation, I went into acute liver failure and a coma. Basically I wasn't feeling well, took a nap, and woke up a week later with a new liver. That liver lasted for several years, but due to a complication with my hepatic artery I required a second transplant on March 1, 2001. I have been fortunate to be very healthy since then and have become an avid participant in the Transplant Games. Cleveland will be my 6th US Games, and I have also competed in 2 Winter World Games and 3 Summer World Games. I compete in swimming, tennis, volleyball, and when possible track. I am also a downhill/alpine skier. I have also been blessed to connect with my second donor family, and they even came to the Games in Houston with me. The connection I have with my donor family has made me even more committed to the cause of organ donation and awareness. I do take my sports and training very seriously, and I take awareness super seriously and want to do all that I can to make the games a wonderful experience, for athletes and donor families and supporters alike. A native of Metuchen, NJ, I moved to Virginia in 1981 to attend the University of Richmond where I first met Matt Felix. We became soccer teammates, fraternity brothers and eventually roommates. On November 27, 2012 we became connected in a much different way when I donated nearly two thirds of my liver to Matt who was suffering with PSC. Today, both Matt and I are doing great! I participated in my first Transplant Games in 2014 at Matt’s invitation as part of Team Liberty (NY-NJ-CT), each of us earning five medals. I may be the only participant to have been beaten by his own liver in a race, albeit by only two tenths of a second. In 2016 I am looking forward to competing in the Games as a member of Team Virginia. Matt and I were recently named by UNOS to be one of the "Faces of Transplant" and I am an active volunteer with Donate Life America and UNOS, working to promote organ donation awareness. I am currently serving on the Organ Procurement and Transplant Network (OPTN) Living Donor Committee and the Scientific Registry of Transplant Recipients (SRTR) Living Donor’s Collective’s Living Donor Advisory Committee. I live in Richmond, VA with my wife Kim and children Ryan (23), Jenny (21) and Mollie-Aidan (10). While I no longer play soccer due to knee surgery and age (mostly age), I am an active runner and try to compete in as many 5K and 10K races as I can. I received my Kidney Pancreas Transplant in 1998 at St. Barnabas Medical center in Livingston, NJ I have been a member of Team Liberty and have attended every transplant game since 2004. I have also attended world games in Bangkok and Gold Coast. Mike received his Kidney-Pancreas transplant in 1998 at St. Barnabus Medical Center in Livingston, New Jersey. Mike has been a member of Team Liberty and has attended every Transplant game since 2004. He has also attended World Games in Bangkok, Thailand and Gold Coast, Australia. Mike has had a successful 34 year career as Athletic Director at St. Benedict’s Prep School, one of the most prestigious prep schools on the east coast, where he also served as the schools Head Wrestling, Baseball, and Soccer Coach. Under Mike’s leadership, the St. Benedict’s Prep Athletic Department has proven to be a great success. He has also held various positions such as President, Vice President, Treasurer of the Essex County Athletic Directors Association, Region and District Wrestling Coaches Association, and the New Jersey Independent School Athletic Directors Association. Mike currently speaks at numerous affairs to help spread the success and need for organ donation and transplantation. Most recently, Mike enjoys speaking to teenagers at high schools all over the state of New Jersey about the importance of registering to be an organ donor on their driver’s license. His proven achievement in identifying creative fund-raising techniques and maximizing opportunities for student-athletes and staff is something that Mike is looking forward to bringing to the Athletic Council. Rich received his "Gift of Life" (kidney) November 17th of 1999 at the Thomas Starzl Transplantation Institute at the University of Pittsburgh Medical Center. I competed in my first games in 1999 at Disney, and have not missed one since then. I was a member of the very first Athlete's Action Council. I am very excited about the upcoming events in Salt Lake City and will be working hard to make this Donate Life America Transplant Games the best ever. Mr. Mozingo received a kidney transplant from a deceased donor in May 2006 at the Johns Hopkins Comprehensive Transplant Center. Currently, Mr. Mozingo is the Team Captain of Team Maryland and a member of the Maryland Chapter of Transplant Recipients International Organization (“TRIO”). Since 2008, he has competed in every national Transplant Games and one state Transplant Games. Mr. Mozingo has won multiple medals at the Transplant Games competing in basketball, golf, and table tennis. Mr. Mozingo also served as the Team Captain for Team Nation’s Capital for the 2010 Transplant Games. Mr. Mozingo works as the Controller for Covenant Life Church and serves as a board member and the golf coach of Covenant Life School. He also coached his daughter’s little league baseball and basketball teams for several seasons. Mr. Mozingo graduated from the College of William and Mary with a BBA degree in Accounting in 1985. Mr. Mozingo resides in Gaithersburg, Maryland with his wife and daughter. My name is Joelle Atkinson and I am a kidney & liver transplant recipient. I was born with a rare kidney disease called Infantile Polycystic Kidney Disease. My kidneys were removed at 9 months and I received a transplant from my dad at the age of 18 months old. My dad gave me a new lease on life. His gift allowed me to walk, talk, grow and dance. I began competing at the US Transplant Games in 1998 in Columbus, Ohio. Back then, there were no kids events and all kids were categorized as 17 and under. My mom brought age categories to the games, and since, it has been an event that kids and families love to attend. Chronic rejection as well as progression of my illness caused me to need another transplant and in April of 1999, I received a kidney and liver transplant from a donor. Since that day, I have thrived. I danced in 11 dances in my dance recital just 5 weeks after surgery. Each year that I compete in the Games, I get healthier and more competitive. During my college years, I have used the Games as a way to lose weight and get in shape. It is a community that I have grown up with and one that I have come to love. I have made friends from all over the world. I am nearly 20 years post-kidney/liver transplant and my health is thriving. I strive to remain healthy and active to show that transplantation works! I have also become an occupational therapist in hopes that I can help others like me continue to do the things that they not just have to do, but love to do! I received my life saving liver transplant on 3/6/2011. It was a life saving surgery, that I continue to be thankful for every day. I am a transplant athlete, who competed in the World Transplant Game in Malaga, Spain. I hold multiple degrees from Illinois Universities, including a Masters Degree in Educational Administration from Eastern Illinois University. I am a retired 35 year educator. I have also served as a high school coach, in multiple sports areas, and an athletic director. I have also been a 25 year sports official for baseball and basketball. I have called tournaments at the local, and state level. I am married to my wife Marie, and have three children, 2 stepsons, 4 grandchildren, and multiple siblings, and relatives. I live in Hillsboro. Illinois, and I am a small business owner. I am proud to serve on the Athletic Advisory Council, and hope to make future games memorable. Diagnosed at age 38 and after living with dilated cardiomyopathy for over seven years, it was time to explore listing for a heart transplant. The testing was positive and 6 weeks after listing I received my gift of life in 2002. Meeting Team Georgia members the next year gave me incentive to get involved with the games. Participating in cycling, table tennis, 5K, softball throw and 100 m dash, the 2004 - 2010 games increased my desire to support and promote organ donation awareness. In addition, directing the Georgia Transplant Foundation Mentor Project and volunteering with LifeLink of Georgia’s Transplant Awareness Group and Emory Heart Transplant Support Group inspired me more. In 2011, I developed a transplant complication and a second heart transplant was needed. On the list for 17 months - including 7 months waiting in the hospital and learning I also needed a kidney transplant kept me from the 2012 games. However, I wore my team uniform resting in my hospital bed watching the streaming opening ceremony. My gifts of life came in December 2012. As my health improved I was ready to join my transplant family again. For the 2014 and 2016 games, I added corn hole and then darts and bocce to my events. A filled pin vest and heart headband are guides for finding me during the games. I proudly display my medals (2006 bronze 20K cycling and 2016 gold bocce) along with the team pins in shadow boxes in my home office. I continue to volunteer with LifeLink of Georgia Transplant Advocacy Group, Donate Life Georgia, Emory Heart Transplant Team mentor and serve as Team Georgia’s co-manager. With my husband Tony, I enjoy traveling in our RV, going to Bluegrass Festivals, serving on the Boshears Memorial Fly-in Board of Directors and playing with our grandchildren. My other activities include reading, crafting, painting, organizing events, and playing the organ and piano but most of all I love sharing my transplant journey honoring the memory of both my donors. (I met my first donor’s family and was able to have his poster displayed at the games.) I am a retired nurse and have always lived in Waynesboro Georgia which is the Bird Dog Capital of the World. Now 60 years old, I am proud of every day, knowing how precious life is! My motto is Live life, Love life, Share life, Give life! It is a privilege to serve on the AAC with fellow recipient and living donor athletes. Amy Frackowiak was born and raised in the great state of Texas. She has been with her husband, Dan, for fifteen years and married for six of those years. They have two teenage boys, Christian and Jason. She was diagnosed with IgA Nephropathy when she was only sixteen and started dialysis when she was twenty-six. On May 18, 2009, she received a kidney transplant from Ninghe Zhang, a foreign exchange student from China. In 2011, after returning home from the games she received a letter from her donor’s parents who live in China. She continues to correspond with them today, often sharing stories of her experience at the transplant games. Amy has participated in the U.S. Games since 2010 and attended the World Games in 2011. She enjoys competing in volleyball, basketball, the 5K, track and field but has also competed in swimming (as needed only basis). She competed in volleyball, basketball, track and field in junior high, high school and all five years that she has attended the games. Her two boys have been competitive swimmers for more than five years so she has some experience with swimming rules and regulations. This summer she will receive her certification as a certified swim official. Amy recently received her Bachelor of Science in Healthcare Administration and works in communications for transplant administration in the Texas Medical Center. She volunteers for LifeGift and speaks at hospitals and clinics about organ, eye and tissue donation. She is currently the Team Manager and Treasurer of Team Texas – Texas Life Warriors. She had the honor of working with Brian Gilliam and Donna Esposito on obtaining a 501(c)3 non-profit designation for Team Texas – Texas Life Warriors. I was diagnosed with polycystic kidney and liver disease (PKD) at twenty-five. My Grandmother had died of complications from PKD shortly after my father was born. My Father also had PKD and became ill when I was six and died five years later from kidney failure. I went another twenty years without any serious health issues working, going to school and advancing in my career as a casting engineer. My health eventually declined as the PKD progressed. I remember lying in bed, wakened by leg cramps; fantasizing that if I could have one wish, it would be to have a healthy kidney and liver. In August 2006 my wish became a reality when I received a kidney and liver transplant. Following the transplant I revived the Indianapolis PKD Chapter, serving as Chapter Coordinator for two years. I have also been a member of Irvington Friends Meeting, serving on ministry and council, and church trustee for a number of years. The Transplant Games are a way for me to give back as well as a strong incentive to work out regularly, something I was not able to do prior to my transplant. I returned to work six months after the transplant and continued working until March 2017 when I retired. I have been part of team Indiana at the transplant games in Grand Rapids in 2012 and the games in Cleveland in 2016. I worked in Mexico through much of 2014 so I was unable to attend the games in Houston. I have run in the 400 meter relay, the 800 meter race walk and 5K. I medaled both years in doubles bowling. This year I plan to add cycling and pickle ball and have given up bowling. Jerry Missel is a husband, father of four and lives in West Michigan. He has been participating in the transplant games since 2006 (Lousville, Pittsburgh, Madison, Grand Rapids and Cleveland). He enjoys working in the steel industry as an operations manager for 2 plants one in Michigan and the other in Alabama. When not traveling or spending time with his family he is an avid cyclist, swimmer and enjoys just about everything you can do outdoors. He views the games as not only an incredible demonstration of the successful lives transplant recipients can achieve, but also as a strong (and needed) incentive for recipients to live an active lifestyle post transplant. Pat is a three-time kidney transplant recipient. In 1971 at the age of 17 she received her first kidney from her brother Tim. After 12 years Pat was in need of another kidney. She received her second one from a non-living donor in 1984. 16 years later her third and current kidney was donated to her in 2001 from her best friend Shelly. She believes that one of the best ways to honor her donors is to live life to the fullest. Her first games experience was at the 1982 World Games in Greece. In 1986 she competed in the first U S Transplant Games in Fort Worth, Texas. She has participated in all but one of the U S games and in several world games. Pat has competed in swimming events, tennis, shot put, ball throw, running relays, badminton, table tennis, 5 K, and bowling. Winning is fun, but her real goal is to help promote organ and tissue donation and to show how successful transplantation can be. At the games she enjoys renewing friendships and developing new ones. Pat is excited to be serving on the TGA Athletes Advisory Council. Over a relatively short period of time the games have grown tremendously. She looks forward to using her past experience to help contribute to the success of the council. I have been a competitive swimmer for over 50 years and have completed in over a dozen triathlons, was a rock climber, even climbed Grand Teton, am a scuba diver, and was constantly going to the gym, so I was surprised when the doctor told me I had hepatitis C and was dying. I was in denial and did not seek treatment for years, until I swelled up like a beach ball and was so weak I could hardly walk across the room. The conventional treatment at that time did not work for me, and although the most obvious symptoms had disappeared, I had developed liver cancer. I received my transplant on June 28, 2005. I was in the hospital getting labs about 3 months after my transplant and walked by a bake sale for "Team Iowa" and stopped to ask who they were. I learned about the games and the thought of competing again got me motivated to get back to the pool and to the gym. At that time I had no idea about the emotional experience of attending the games and was going because I wanted to compete. Of course, after a thousand happy tears and even more hugs at my first games in Louisville, I understood. I have now been to six US games, twice accompanied by my donor's mother and sister, and five world games. In the time coming up to the games, I received an anonymous letter through the Iowa Donor Network from the mother of my donor, Jo Leah, telling me my donor's name was Sarah, had had passed away due to an AVM. She was 25 and had three young children and Jo Leah wanted to meet me. We wrote back and forth a few times over the course of the next few months. I was consumed with guilt and was afraid to meet her. We finally met at a Masters swim meet and after crying and hugging we became close friends. Meeting her and hearing her story was the most rewarding experience of my life, and she has attended several other meets, plus two Transplant Games. I can think of no better way to honor her daughter for her tremendous gift. I have been involved with the Iowa Donor Network since then, volunteering for Team Iowa, and the Donor Network, spreading the word about the success of transplant and the need for donors. I have handed out hundreds of donor registration cards at swim meets. I am a personal trainer, swim coach and lifeguard at the local YMCA and have taught 100's of children how to swim. I train year round to be ready for the games, and looking forward to seeing all my friends again in Salt Lake City. Bill Wohl, a former collegiate, professional athlete and successful businessman. His company has worked in custom integration worldwide from the Olympic Games, World Cup, Championship Golf, Championship Boxing, World Series, NBA finals,etc. In 1999 Bill had a massive heart attack with two 100% blockages for 7 hours destroying his heart muscle. When all organs failed his heart was removed. Replaced with a Total Artificial Heart. Then a "terminally ill FDA experiment for the next 159 days . In February 2000 he received the heart of a 36 yr old Hollywood actor/stuntman Brady Michaels. Brady had an accident on a TV set near by and became Bill's donor. Bill with a total artificial heart appeared in Novartis spring 2000 "Transplant Video Journal" which also had a story on the US Transplant Games. As a former swimmer, runner cyclist the hook was in. By 2002 Bill was representing Team Arizona in Orlando, Fl. and the next year Team USA in Nancy, France. He began competing monthly in open competitions, and annually U.S Games, Canadian, Australian and World Games. In open events the "Race to Athens" Beijing "Haul to the Wall" . Annually "The Escape from Alcatraz" Triathlon, also Cycling, Swimming and Marathon events. Honored as Captain of Team USA Cycling 2007 Bangkok, 2009 Gold Coast. Accumulating in Transplant games 31 gold, 21 silver and bronze. Setting records in the pool and on the bike in the US, Canada and Australia. Promoting Donor Awareness on the front page of USA Today, Cover of Life magazine, Nat Geo, People, History channel, Discovery channel, ABC, CBS NBC, PBS, Fox winning an Emmy for his story, etc. Bill has been blessed to mentor in our world transplant community. Promoting Organ Donation in North America, South America , Asia, Europe and Australia. Bill was founder of the Arizona Donor License Plates in 2002 and his foundations World Transplant Triathlon Team in 2007. Their goal to show Transplantation works. Bill is always looking to make the path a little brighter and easier be it living donor, donor family, recipient or caregiver. Currently he waits for heart number four. Listed for Transplant at Cedars-Sinai in LA. He is training for Transplant again and brings some varied sport, work and foundation experience to our group. TJ is a two time kidney recipient who received the gift of life in 1994 and 1996 from anonymous, deceased, donors. He has spent the years since his transplant helping to spread the word about the importance of organ donation and has a goal to increase awareness as much as possible. Since TJ received the gift of life he obtained both an under graduate degree as well as a graduate degree in Computer Information Systems from Grand Valley State University. In 2012 he initiated the TJ Maciak Give Life Endowed Scholarship at GVSU to help those students in college -- who like him -- are waiting for, or had, a life saving transplant. TJ has been participating in the transplant games since 1996 and has attended 6 world transplant games representing team USA. In 2011 when TJ heard that the US Transplant Games would no longer be held he did everything he could to not let the games be finished. Because of his determination, motivation and the attitude that the games were so important to so many people and they should go on, the Transplant Games of America were born and the legacy of the transplant community will hopefully continue for a long time to come!